Some projects turn out exactly as you had imagined them, and others . . . Well others just take on a life of their own. This project was one of the second variety. March was my month to choose a project for the Mid-Century Modern Bee and I chose the Hugs & Kisses block by Little Miss Shabby. And then I dug into the stack of charms I had gotten in the Low Volume Swap last summer. Without even realizing it, I even used the fabric I had swapped in my sample block - the blue/gray/white circles (Quilt Blocks by Ellen Luckett Baker for Moda Fabrics) in the bottom right-hand corner. The blocks came in right on schedule, and one day I put them all on my design wall and began mulling over what to do with them. I posted a picture in the flickr group, and my bee-mate Carla/Grace and Favour made the quilt-changing suggestion to put them on-point. Oh yeah. At that point, I was talking filling in around the blocks with solid grays when bee-mate #2, Linda/Flourishing Palms suggested matching up with the skinny bits to make all those block conjunctions squares. Good idea! But when I started adding those pieces up on the wall, it dawned on me that I really needed to link up the skinny bits out on the edges too. So that's what I did, using three different grays in the process - Kona Ash and Iron plus Michael Miller Couture Stone. Things were getting a little more complicated . . . If I'd known all along what the outcome would be, I would have pieced things just a bit differently, but I made it work, and was pretty pleased with the result. If I had it to do over, I would have used more low-volume prints for those squares inside of the 'border' line, but then again, I didn't really 'see' that till I was done. Anyway, I forged ahead, quilting with Aurifil Light Beige (#2310). I did a straight-line coil, starting off centered in the upper-left of the quilt and echoing at 1" increments. Binding was scrappy solid grays with a couple of snippets of gray prints. To be honest, this quilt is as much a collaboration as any I've done. 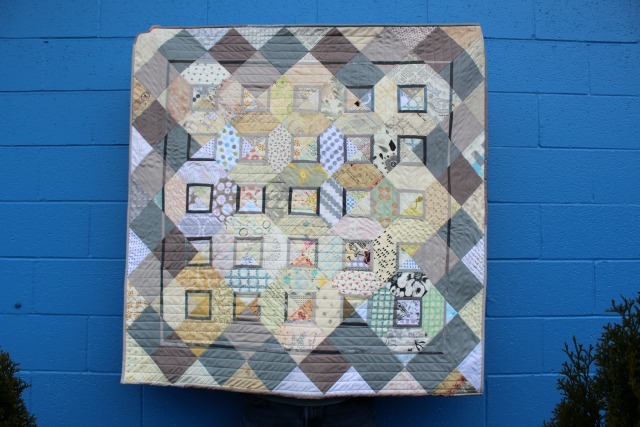 The block was designed by Little Miss Shabby, my Mid-Century Modern Bee joined me in making blocks, Carla suggested the layout, Linda gave me the idea of continuing the accent strips, and I ran my quilting and binding thoughts by daughter dear before moving forward. So yeah, it's small (45" square) but for me, there's alot wrapped up in this quilt. As I finished it, I started mulling over a name for it, and I came up with "Common Affection" - common for the cooperative effort of my bee in working jointly towards a goal, and affection as a nod to the Hugs & Kisses block. Weather wasn't really conducive to a decent photo shoot, but hubby was willing to run out during a break in the rain and let me take a few shots. I loved the one against the blue building (a random smoke shop! ); he liked the one below against the brick. So I figured I'd share them both . . . This project is on my Q2 Finish-A-Long list. Also linking up with Fabric Tuesday. It turns out gorgeous Debbie! I love the neutral colours.. so loving low volume now..but have not start on any project with them yet.. Yours is amazing! This is gorgeous...an award winning quilt, I am sure. Well done! I love this quilt...but I think you already knew that! It is so individual and YOU! I think I like the blue photo, and the grey one too! And what a great name! Fabulous all round! I really like that the blocks are on point it's gives it such a different look, really fantastic quilt your low volume fabrics are great!! I've gotta say, when I saw the first pic, I was far from impressed. Of course, I'm a color person, so it just wasn't floating my boat. But now I must say, I was really impressed at its transformation. First, the "on point" was a great idea, next the darker gray really punched it up and then the small stripe added icing to the cake. Congrats on a job very well done! Oh I love it! So much! The setting is just perfect and it's a great way to show off those low volume prints. I feel you have something very special there! Love Love Love! Spectacular layout! This is such a great quilt and I love it exactly as it is! It turned out so beautiful, Debbie! I love that there are so many different design elements to study when you are looking at it. Very cool! And so fun that you had such helpful bee mates! Gorgeous and I love your creative border! Great finish and congrats on being able to mark something off of the Q2 List - Kudos to you! This quilt is amazing Debbie! love the group effort, love everything about it! Lovely! Thanks for sharing the process, too. Hubby's a keeper! This is just beautiful and the name is perfect. I'm thrilled with this bee and the incredible women in it. This turned out so perfectly lovely, Debbie! What a great take on a low volume quilt! Really cool! What a great collaboration. It's absolutely stunning, Debbie. I so love how you managed to put all these blocks together and that added border is just perfect!!! what a fantastic team of inspiration and effort! it looks great, love how it came out, and on point was genius! Your quilt turned out wonderfully. I really like the picture of it against the blue wall. And your name is perfect. I like the hearts around the border! I think it is perfect. Such a beautiful quilt - I love how you have quilted it! It's got a great feeling of transparency, Debbie! I love it! one of the coolest quilts i have ever seen - 100% LOVE! so pretty, in fact, i had to visit it again this morning (: i saw the hugs & kisses block/quilt pattern and it did not jump onto my "want" list at all...but i have to say the way you did it made it jump right to the top...5! i actually have a pile of low volume fabrics waiting for a eureka moment - perhaps they will get to be hugs and kisses...but not on point and not with all of the other fabulous extras and upgrades you provided yours...maybe i will just make the simple one - i'm sure it would still be good enough for me and my humble aspirations (: but yours is truly gorgeous - VERY inspiring!!! You're so kind to credit me with helping you on this quilt - the name for it is perfect! I think it turned out beautifully, and is certainly something you couldn't' have PLANNED this way. I do hope you'll enter it in the AQS Modern Quilt Challenge. It's definitely worthy! 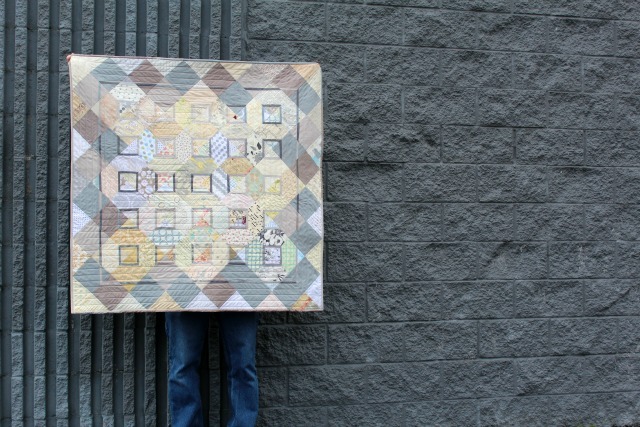 What a great post about your clever and gorgeous quilt! I love the name that you came up with...it's perfect!